The Krewe of Neptune was founded in 1981 by founding officers Kenneth Fournier (Captain), Gray Slay (President), Sandy Steckler (1st Vice President), Dr. Michael Bourgeois (2nd Vice President), Barry Barq (Recording Secretary), Burt Tremmel, Sr. (Corresponding Secretary) and Bill Pittman (Treasurer). Charter membership consisted of 150 members. Over the past 29 years Neptune has had members from as far away as Houston and Atlanta. With the Krewe selecting the Gulf Coast as its home, it was only befitting to select a name that is related to the water. 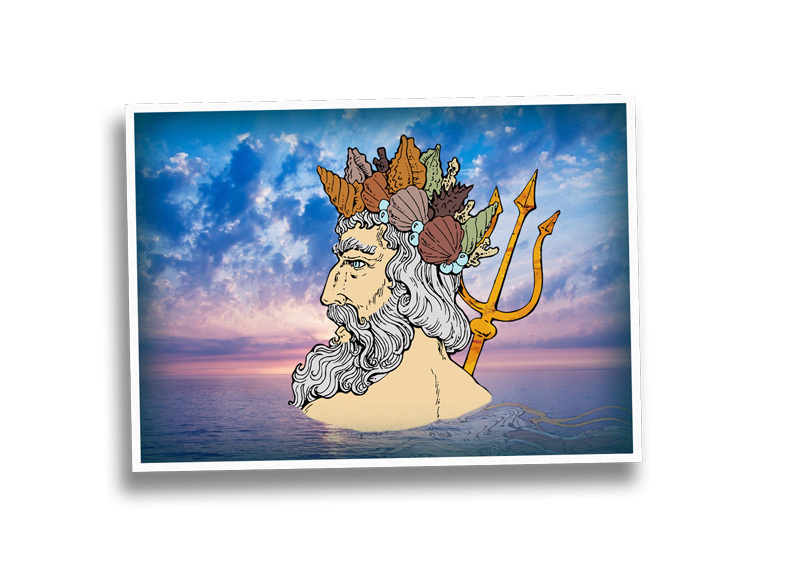 Neptune is the roman God of the Sea and was a fitting choice.  The Krewe of Neptune is patterned after the old-line New Orleans krewes which are heavily based upon secrecy. Each year, Neptune holds a “Bal Masque” with all members wearing some form of mask and no members names are ever announced our listed in the program. The only names listed in the program are the female members of the court, the Maids and Queen. The tradition holds that in earlier times, the businessmen of New Orleans were not able to frolic and celebrate in fear of losing business. For this reason, masks were worn and names were never announced. 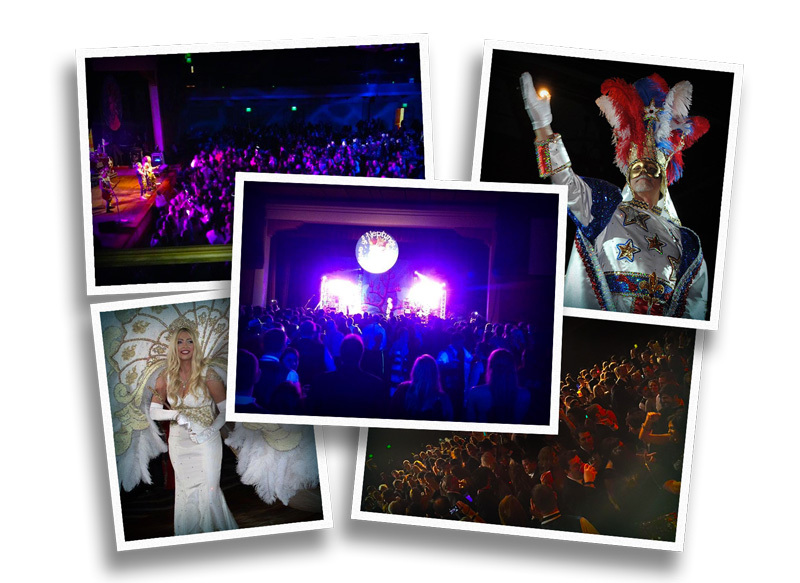 The 1982 Carnival Season played host to the Krewe of Neptune’s inaugural ball where Neptune presented “The Sea”. Reining of the first Neptune celebration was King Neptune I – Vincent Clements and Queen Venus I – Sarah Jane (Wilson) Sullivan. Each year the Officers and the Captain select a theme for the upcoming celebration. The King and the Dukes are selected by the draw of a hat of interested parties. The Queen and Maids are selected from member’s daughters, granddaughters and nieces. The Queen and Maids must be between the ages of 18 and 26 years and have never been married. 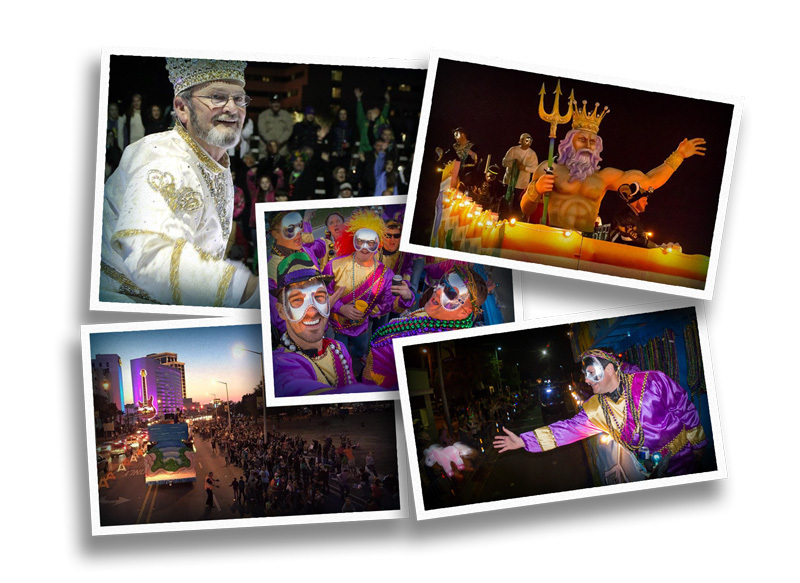 The Krewe of Neptune’s first parade was held on Mardi Gras Day in 1983 on the streets of downtown Biloxi. The parade is unique on the Coast in that all the Krewe’s floats are commission in New Orleans and transported to Biloxi. The organization is divided into smaller Krewes with a Line Lieutenant in charge of each Krewe. Each of these Krewes’ floats represent something different pertaining to the theme of the ball. 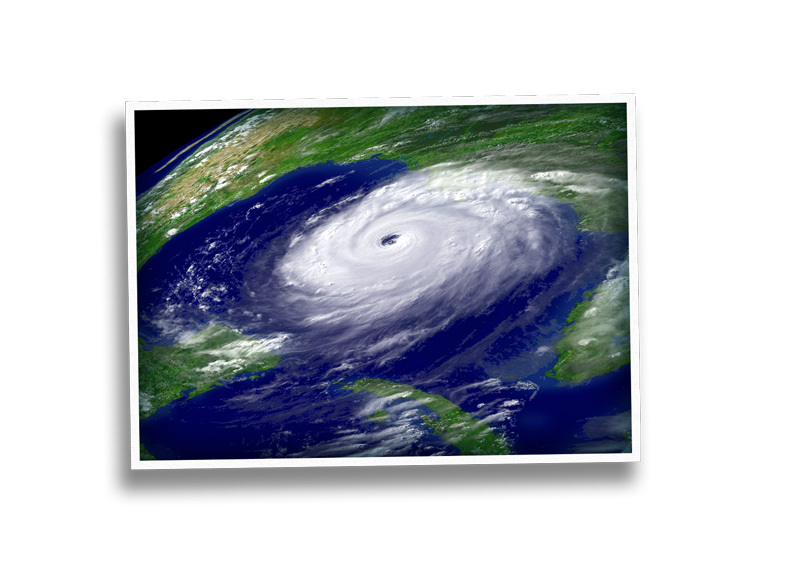 Neptune was dealt a massive blow on August 29, 2005. With her 125mph winds and 25+ foot storm surge, Katrina did all she could to destroy the spirit of Carnival along with every structure she took down in her path. Once the Sea had settled to its rightful place, the Krewe of Neptune found itself very much reflective of that of the Mississippi Gulf Coast. 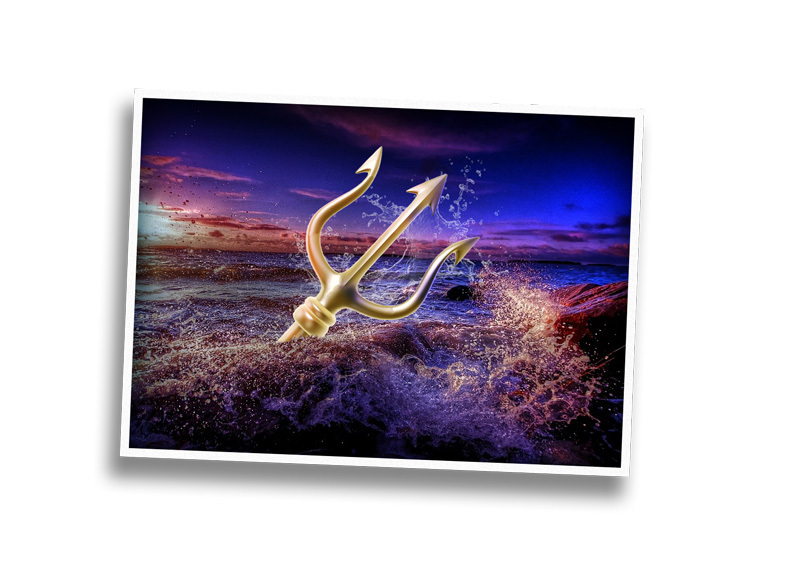 Given our ties to the sea and its ruler, the Krewe of Neptune was not going to let Katrina define its fate. With the resurrection of the Coast, Neptune too would rise from the blasted shore and rubble to prove it could Weather the Storm. In 2009, six young businessmen from the Gulf Coast met with the officers of Neptune and developed a plan that would not only resurrect the Krewe of Neptune, but restore the Krewe to all of its glory. Five months later “NEPTUNE WEATHERS THE STORM” was held for the first time since Katrina, with the Krewe of Neptune parade proudly rolling the streets of downtown Biloxi on Fat Tuesday for a proper Mardi Gras.